Keeps your small tools and parts organized and safe on your bench. 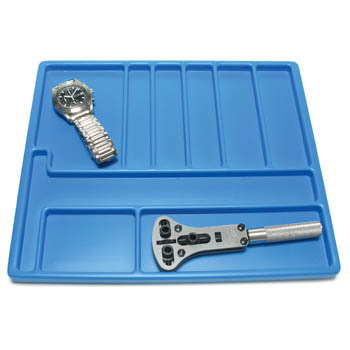 Keeps your small tools and parts organized and safe on your watchmaker’s bench. Various sized compartments accommodate a number of items. Blue color makes it easy to see small parts. 10-7/8" x 9-3/8" x 1/2". Swiss made.